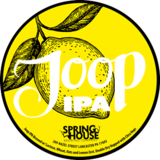 Please welcome the newest addition to the Joop family, the Lemon Citra Joop IPA. This hazy, soft IPA is brewed with oats, lactose and lots of Citra hops, then double dry hopped and fermented with Citra hash, vanilla beans and lemon zest. It’s juicy, it’s smooth, it’s sure to please.